Athletic gear of all types can become sweaty, grimy and smelly after use. 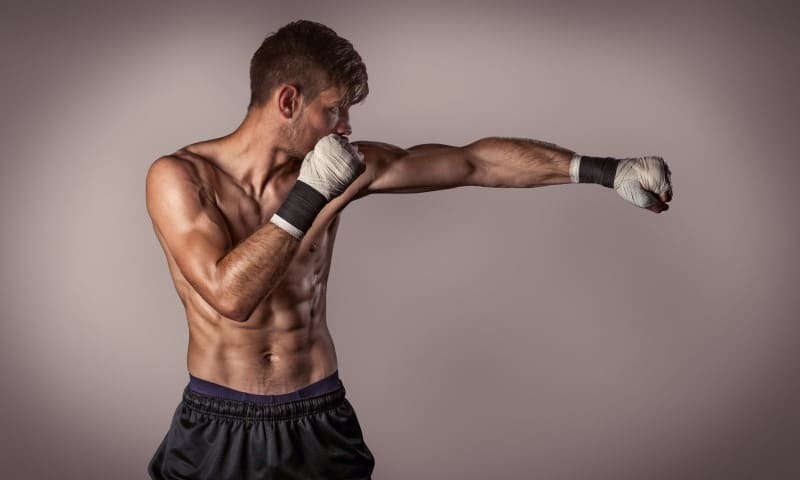 It makes sense, when you sweat like a crazy during your workout, you create a breeding ground for bacteria, fungus and other “stink.” Boxing and MMA gloves are no exception. However, unlike your favorite shorts, cleaning your leather boxing gloves is not as simple as dropping them into the washing machine. While there are different techniques to stop boxing gloves from smelling, we’ve put together a basic process that you can use as-is or adapt for your unique needs. The first tip to keep your gloves smelling better is to not leave them hidden away in your gym bag. This is not a case of “out of sight, out of mind.” It is vital to keep your equipment dry to avoid smells. If you set your gloves out to air dry after every workout, they will stay fresher longer and you may never even need to know how to clean leather boxing gloves. However, if there comes a time that you want to clean and sanitize your gloves, doing so will help them continue smelling fresh and serving you well for as long as possible. The surfaces of your gloves are very easy to clean. Just a quick wipe down with warm water is usually fine. If you have special glove cleaner, using that on occasion can’t hurt matters either. However, just make sure you dry the surface well too. If you need to clean the inside of your gloves, the process will vary depending on what material was used to make your gloves. For many gloves, washing in a saline solution is ideal. It is not as harsh as bleach or other cleaners, but adds an extra boost to plain water alone. Soak the gloves for at least an hour and then rinse, rinse, rinse with fresh water. When you think the gloves are rinsed out, rinse one more time. Another option is to clean boxing gloves with baking soda. You can do this without adding water—just add soda, let it absorb odors and then brush away before use. Shake out the excess water and use towels to absorb as much water as possible. Then, find an area with plenty of fresh air to let the gloves dry. Don’t rush this process—your gloves should be completely dry before you use them again. One trick is to try stuffing newspaper into the gloves. The newspaper draws moisture out of the fabric and can help speed along the drying process. Some boxers recommend using Lysol or Febreze for extra deodorizing. While these products may work, they are full of chemicals and may cause your gloves to break down faster than if you didn’t use them at all. If your cleaning and drying process hasn’t resolved the problem, using one of nature’s greatest deodorizers, vinegar, may do the trick. Start with clean dry gloves. Then, pour about one tablespoon of apple cider vinegar into your hand and rub it inside the gloves thoroughly. Then, lay your gloves in an area where they can easily dry out. If you have a fan or can lay them near an open window, will be ideal. Make sure the vinegar dries naturally. While the above process is a terrific way to work through the serious stink, we’ve gathered a few additional tips to help you on a day-to-day basis. Taking every precaution possible can give you gloves that will smell like new (or at least not like old feet) for much longer. Try Your Freezer – If you still have some lingering scent, you may think about freezing your gloves. Put them into an airtight container (so they don’t transfer the scent to your frozen broccoli or cookie dough) and put in your freezer overnight. Then, when you remove them, put them out into the open and let them air dry for at least 24 hours. You will be amazed by the difference this can make. Expedite the Drying Process – Sometimes, the biggest problem is that the gloves never completely dry in between uses, even if you try to air dry them. You may try filling a pair of socks with clean clay kitty litter (perhaps with a little baking soda mixed in) and then placing this inside your gloves when you’re not using them. It can make the drying process work much better and prevent smells at the source. It Starts with Your Hands – Before you put on your gloves, wash and dry your hands. When you do this, you are not introducing additional bacteria (the cause of most smells) into the glove. Plus, you’ll only have to deal with the sweat you work up while training. With all the above strategies, you have many methods to look at combating “glove stink.” Hopefully, you will find some way to make your future workouts much more pleasant!